This morning's New York Times brings the sad news that Dith Pran, the photographer portrayed in the 1984 movie The Killing Fields has passed away, at age 65, in Woodbridge, New Jersey. His obituary is a compelling story, detailing his harrowing life in southeast Asia, especially after the Khmer Rouge controlled Cambodia. 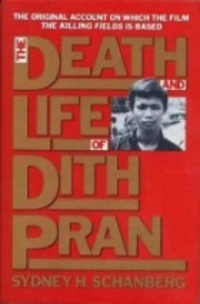 (Dith Pran , ‘Killing Fields’ Photographer, Dies at 65) It's an amazing story of resilience and humanity amidst the most horrific of circumstances. But after Dith saved Schanberg, Dith was sent to a rural labor camp. For years there was no news of Mr. Dith, except for a false rumor that he had been fed to alligators. His brother had been. After more than four years of beatings, backbreaking labor and a diet of a tablespoon of rice a day, Mr. Dith, on Oct. 3, 1979, escaped over the Thai border. Mr. Schanberg flew to greet him. Having learned French at school and taught himself English, Mr. Dith was hired as a translator for the United States Military Assistance Command. When Cambodia severed ties with the United States in 1965, he worked with a British film crew, then as a hotel receptionist. Ah, what a reminder that people with astonishing gifts and resilience are found in many, many places. We have been fortunate to have been the beneficiary of Mr. Dith's talents. We also ought to remember that there are many other people, who have much to contribute, whose names we will never know. It's often by reading obituaries that I recall this lesson.